Let’s rewind to Valentine’s Day. I’m single. I’m not feeling well. My mom is in town and our plan is to eat dinner and watch movies. 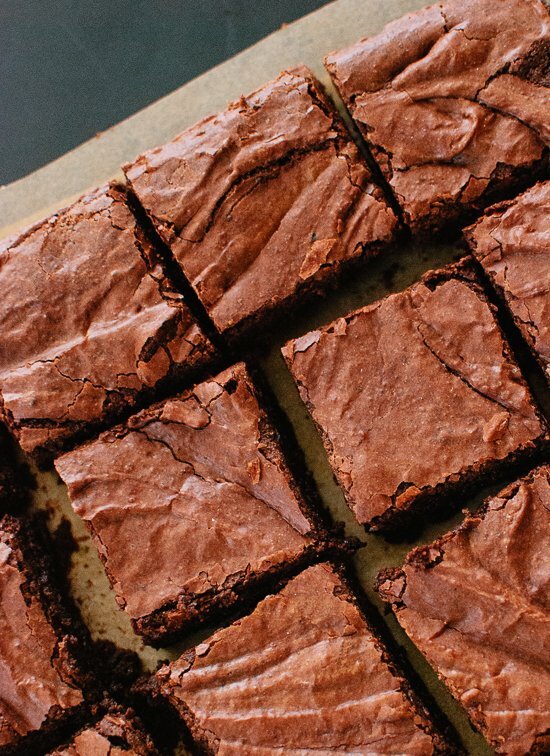 As the sun goes down, I decide that I need a brownie—like I really need a brownie, for aforementioned reasons—and proceed to pull every baking book off of my shelves in my search for my ideal brownie recipe. I wanted rich, dark, chewy, legit café-like brownies with crackly tops. I didn’t want gooey, fall-apart, stick-to-your-front-teeth brownies. I also didn’t want health-ified brownies or brownies swirled with cheesecake. I wanted one perfect brownie. Sometimes a girl just needs a brownie, you know? I finally found a promising recipe in my copy of Alice Medrich’s Sinfully Easy Delicious Desserts. It was a thinner brownie than I wanted, but it looked dark and delicious and had the most magnificent shiny, crackly top. 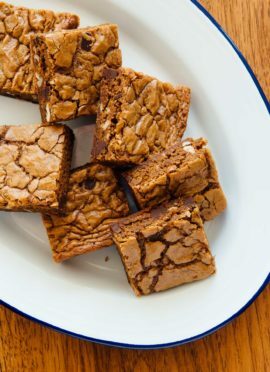 The recipe contains a fair amount of butter, as legit brownies should, and the butter is browned before the addition of sugar and cocoa powder. If you’re going to put a lot of butter in something, you might as well brown it for extra flavor. Alice’s recipe also called for a lower-than-usual baking temperature (325 degrees) and specified that the brownies be baked in the lower third of the oven. All of the chocolate flavor came from cocoa powder, too. Interesting. Alice’s brownies made from scratch turned out beautifully. Crackly top. Dense, fudge-like interior. Rich, complex flavor. They weren’t quite matching my idea of the quintessential brownie, though. I wanted a taller brownie, one that is a little more like a brownie than fudge, with some chopped dark chocolate thrown in for textural interest. Thus began my obsessive quest for the quintessential brownie recipe. Five batches of brownies and a bunch of brownie research later, I think I’ve found it. I learned a lot along the way. I learned that in order to achieve the shiny, crackly top, you have to stir the sugar into hot butter so it melts. Alice’s low baking temperature and rack positioning also seem to improve texture, but I couldn’t tell you why. Michael Pollan, my favorite food writer, came to Kansas City last summer to talk about his latest book, Cooked. He finally solved the boxed mix mystery for me. Pollan explained that the first boxed mixes contained powdered eggs, which removed the step of cracking eggs into the bowl. I mean, why go to the trouble of cracking eggs into a bowl if you don’t have to, right? Wrong. American women initially wanted nothing to do with the boxed mixes. They felt like they were cheating when they used them. Once the manufacturers took out the powdered eggs so we could crack eggs over the bowl, we felt like we owned the final result. The baked good was then homemade enough to present to our loved ones. If you have never made brownies from scratch, give these a try and I promise you’ll never reach for a box again. 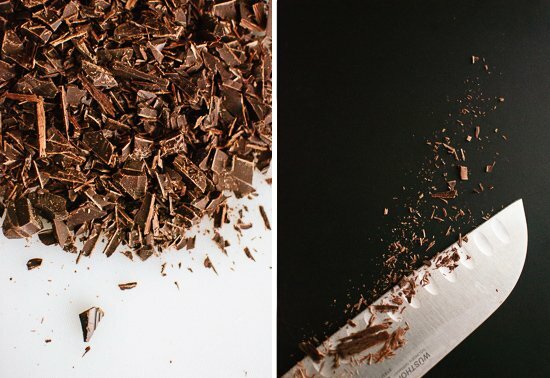 If you’re pinched for time, throw in chocolate chips instead of chopping the chocolate by hand. Ta da! Homemade brownies made from scratch and baked with love. 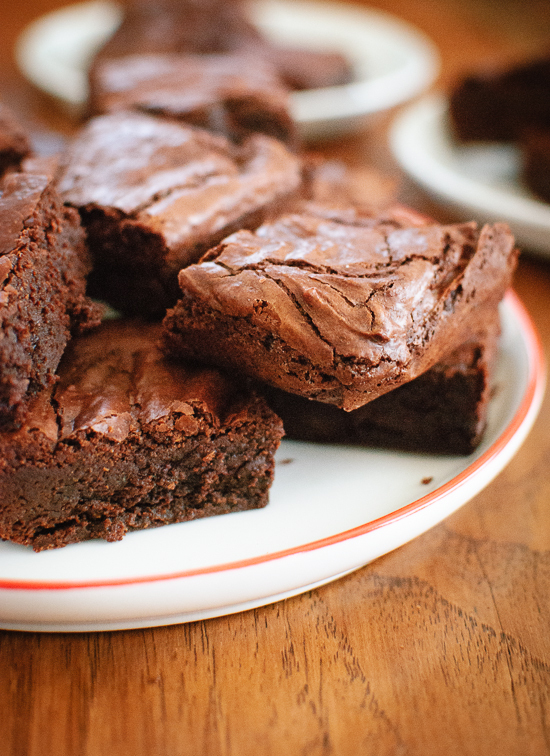 Rich, dark, chewy and fudgy brownies made from scratch. 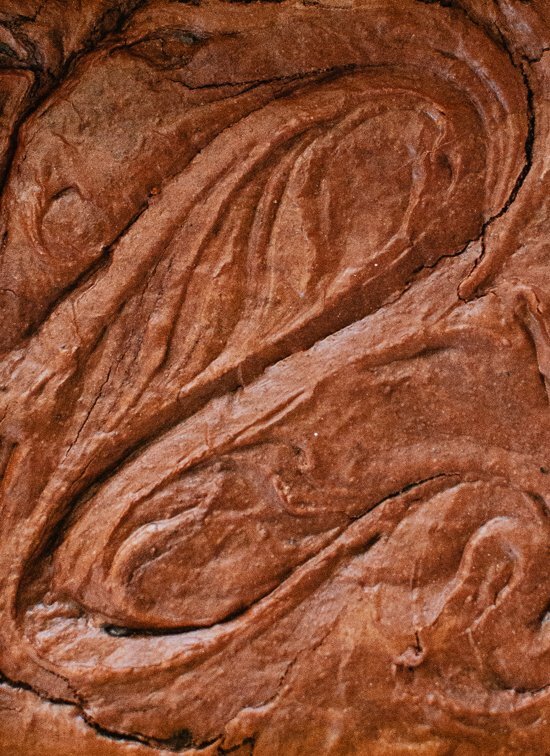 These brownies are flavored with cocoa powder and brown butter and feature a beautifully swirled, flaky top. 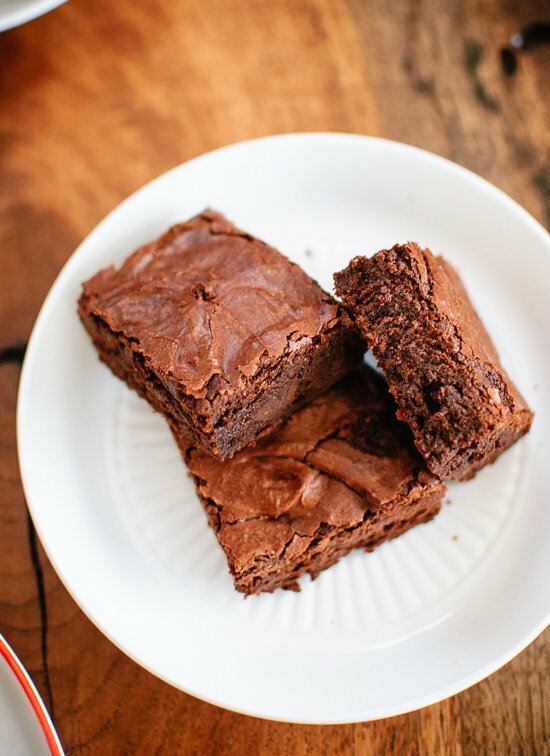 I don’t dare make claims like this very often, but this is the very best brownie recipe! Spread the batter in the lined pan, then use a knife to make light swirls in the top of the batter. Bake on the lower rack for about 25 minutes, until a toothpick inserted in the center comes out mostly clean. Cool the brownies in the pan on a baking rack. Adapted from Sinfully Easy Delicious Desserts and King Arthur Flour. These brownies freeze well. Store them in a freezer-safe bag and let them defrost at room temperature. For more dense and fudge-like brownies, cook the brownies a minute or two less. 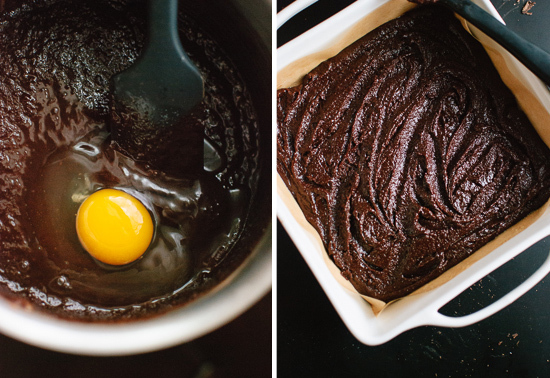 For more fluffy and cake-like brownies, add another egg. For less rich brownies, skip the chopped chocolate. 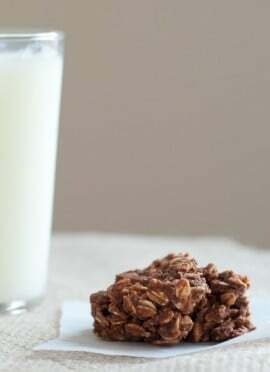 If you like nuts in your brownies, fold in 1 cup walnut or pecan pieces along with the chopped chocolate. P.s. 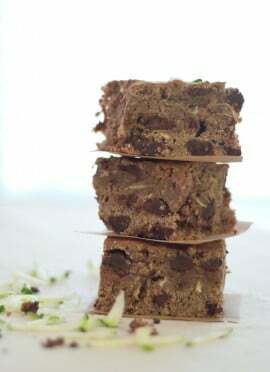 If you really want health-ified, naturally sweetened brownies, I have some dark chocolate zucchini brownies over here. Note that they don’t have the crackly top that these brownies do and that the zucchini hardly adds much nutrition because it’s almost entirely water. If I made them again, I would try skipping the zucchini altogether, upping the cocoa powder to 2/3 cup and decreasing the baking powder to 1 teaspoon for richer and less cakey results. 5/2/14: sorry folks, Terri says the brownies don’t turn out well when made this way! I definitely missed something. Even while mixing, I kept thinking something was off and looked to check the recipe multiple times. The timer just went off and they aren’t even close to cooked with no sign of crispy top. Hmmm… Interesting. Do you know what you think you missed for ingredients? No issues with your oven heating? Yes! I’ve had the same issue too. I kept checking the recipe to see if I had done something wrong. When the brownies are baking, is it normal for the butter to boil up at the top of the brownies? I had to pour out some of the butter when I took the batch out of the oven. HI I made these brownies, browned the unsalted butter as you said, took it off the heat and added the cane sugar, cocoa ext, but the sugar didn’t melt? The butter had been boiling as I stirred it. The batter was very thick after eggs, vanilla and flour were added. Hi Susan, I’m sorry to hear about your sugar troubles. That’s strange, since sugar usually dissolves when mixed with very warm liquid. I am not sure what went wrong, but I used organic fine cane sugar for these. I had the same problem but it was because I was using regular sugar in the raw (which is fairly course.) I made them again with plain white sugar (which is far finer) and it resolved the issue. However, if you want to use sugar in the raw, just run it through the food processor until it is fine. These brownies tasted ok but as I like very fudgy brownies, these didn’t do it for me. They were dry and cakey. My perfect brownie recipe search continues! I’m sorry you weren’t happy with these! How long did you leave them in the oven? I followed the recipe to a “T”, though I did have to use a 9″ x 9″ pan. The brownies didn’t rise much at all – turned out almost fudge-like. Still good, but hardly the brownies that I was anticipating. What might have happened? Hi Eric, I’m sorry to hear that! Is there a chance you forgot to add the baking powder, or could your baking powder be expired? It helps the brownies rise. The brownies came out pretty well! The browned butter adds a nice flavor. I baked them for 25 minutes, but the middle still seemed gooey and uncooked. However, after they cooled they were completely fine. I used instant coffee crystals, but they wouldn’t dissolve in my butter and sugar mixture. I recommend dissolving in a small amount of hot water first. Thank you for sharing this recipe! Hi Angela, I’m so sorry to hear that. Quick question—did you use a glass pan or a metal or stoneware pan? I have a hunch that glass pans might cause that issue, but I’m really not sure. Hi! Could you send us the measurements for this recipe in grams/ml for all of us EU brownie lovers please? Thank you! Hi Diane – You can find an online converter. Try this one: http://dish.allrecipes.com/cup-to-gram-conversions/. Let me know how it works! We prefer less sweet, so I only used half cup of sugar instead of 1 ¼ cups. Didn’t get much crust as expected, but still turned out delicious! just a little tricky to measure out 10tablespoons of butter, cups or weight would be easier. thank you so much for sharing! The decrease in sugar would likely change them slightly, but I’m still glad you liked it so much! Thanks, Yilam for sharing. What could I substitute for eggs? 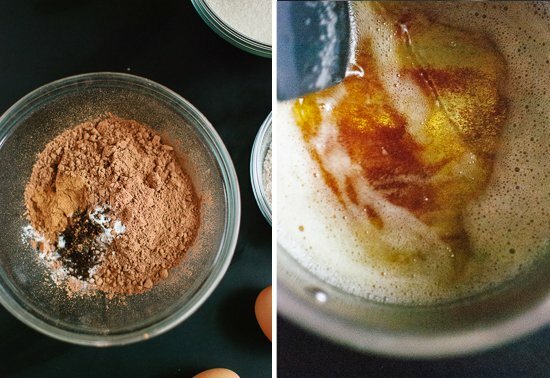 You could try using some vegan egg substitutes, like flax eggs or aquafaba. Maybe poke around the comments here and see if another reader has had some success, as I have a lot of helpful folks that leave tips and tricks for substitutions for specialized diets. Hi! I mjust want to tell you that I’m looking forward to baking brownies and banana bread tomorrow! I can’t wait to try your recipie,it sounds delicious!!!! I have a question…Do you have a bakery? If so…how did you start your business ? Hi Kate, just made your brownie recipe almost exactly as written and they came out great. Cracks, swirls and all. Used Guittard Cocoa Rouge powder (awesome stuff), cut back on sugar a bit and baked a little longer since I have to use an old, cr*ppy apartment oven. Would send you a pic but I don’t do social media, aka Instagram, Facebook, etc. I love when that happens! I’m glad they were just as great for you, Denise. 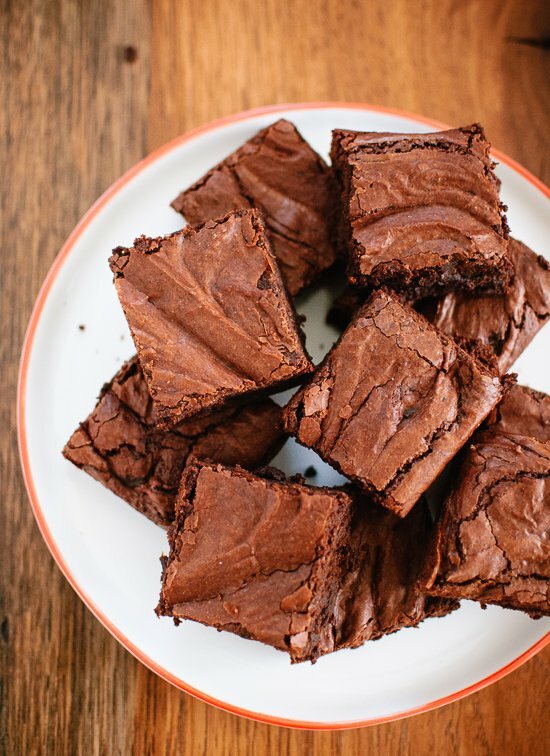 I’ve tried a lot of brownie recipes, trying to eliminate my preference for boxed mixes (brownies are the only thing I never liked better from scratch!). I think I can finally say I don’t need to ever buy boxed brownies again, thank you!!! This recipe was wonderful, a beautiful crackly top, not too dense or too cakey, just a perfect brownie. I didn’t have that much cocoa on hand, so I reduced the cocoa and sugar and replaced it with more chopped dark chocolate. I also threw in some walnuts, and it was perfect. Thank you again! I’m glad this worked well for you! Thanks for sharing, Hania. Hey, what’s the substite for cane sugar? Or what is cane sugar? I can’t find it in UK supermarkets. Also, isn’t most sugars from sugar cane? Gah I’m desperate to make these! Hi Snigda, so sorry for the confusion! Use your regular grocery store sugar. It will work! Just made these, they were really really good- super rich and decadent. I added toasted walnuts. I also added an extra egg as suggested to make them “cakey” however they were not at all cakey, they were like fudge. I also swirled some almond butter across the top. Next time (and there will definitely be a next time) I will bake them 3-5 minutes longer than the reccommended 25 minutes. Premium quality chocolate and cocoa powder are worth it and will really shine through in this recipe. Oh, toasted walnuts. Lovely! Thank you for sharing, Leah! The brownies I was raised on always had a crispy top. I hated when people would make boxed mixes because they were too gooey! I love seeing other crispy top fanatics. I still have my mom’s recipe, that is my go to, but maybe I will have to try yours as well! Oddly we don’t use butter at all in our brownies, we use Crisco. I would like to ask why do we need to beat the batter for the 50 strokes. Because most recipes say to mix until just incorporated after adding the flour as the gluten may form. So I really want to know what is the science behind it. Hi Zephy, the amount of butter used here keeps the batter from getting tough. Beating the mixture ensures that the batter is fully emulsified before baking. You’ll find some more insight here! BTW, doors it matter what time you put the baking powder in? I love your brownie recipe! Made it many times:)! I have questions that once I cut it and leave it to room temperature, the brownies’ surface gets dry. -do I keep it in fridge after cutting? -should I take out from the oven earlier than your mentioned time? -should i wrap it when it’s still warm to make moisture? I want keep it as fresh as long as possible! I would appreciate that if you could answer my questions. Looks amazing. I know it will be so delicious as looking. I can’t wait to try this recipe at home. I am big fan of cakes. I had a brownie craving so I searched “best homemade brownie” then as I was scrolling I was like “what am I doing? ?” And immediately added “Cookie and Kate” to my search bar. Of course you had a delicious and different sounding recipe! I accidentally heated the butter in a pan not a pot, but I think that helped speed my Browning process along. I was a bit worried that it didn’t appear that my sugar totally melted but it didn’t seem to do any harm. I used “the saco pantry” cocoa, a blend of salted and unsalted butter based on what I had – so used a little less salt, and Trader Joe’s dark chocolate for the chunks. I don’t haven have an 8×8, but rather a weird IKEA pan (maybe 8×4?) so had to improvise on time. Did it for about 35-40 minutes until a toothpick came out clean. These are exactly what I wanted. They’re fudgey but not too dense. I don’t really taste the coffee grounds but I’m glad they’re in there. They taste so good and and I’m so glad I didn’t buy a boxed-mix to satisfy my craving. These are divine! I love that! Thanks so much for sharing and I love being a go-to for you. I appreciate the review, Madison! I followed the recipe exactly and even after 35minutes cook time and 10minutes cooling time, these were a goopy mess. I double checked everything, used chocolate chips and King Arthur whole wheat. These are dangerously good and worked out perfectly. I used cacao powder instead of cocoa, and it took an extra 10 minutes in the oven. This is my new House Brownie for sure! I also found this recipe strange. It was incredibly thick when mixing the browned butter with the sugar. It thickened up more after adding each egg, so that the mixture was thick enough to stand a wooden spoon in. Due to the thickness, it did not change shape or rise at all when it was smeared into the pan. That said, the taste was not bad, it just felt more like a chocolate spread than a baked good. I will look elsewhere for a crackly top, but still have belief that browned butter is part of the secret! Hi Kathy! I’m sorry these didn’t turn out for you. I’m actually testing these to see what has been happening. Would you mind telling me the type of baking dish (material) and size you used. Hi – I baked these brownies with love, however, they came out very dry and with a bit of a grainy texture. I did cut them about 8 minutes out of the oven and I am not sure if this is the reason. I was disappointed in myself so I threw the entire batch out before they were cool…. Hmm. Followed exactly, but used white flour and added 1/3 cup peanut butter chips along with 1/3 cup chocolate chips. The batter was very gritty and thick. Had to press it into the pan. No shiny top, no cracks. Not appealing looking. Cooling now, hopefully they taste better than they look. This recepie doesn’t specify that you should probably be using very fine cane sugar, and I’m hazarding a guess that that was my problem here. I used the stuff you can get at The Bulk Barn which is slightly larger grains and it was an absolute disaster. Tried my best to salvage things by using regular granulated sugar, and mixing the butter in normally for round 2, but I guess that method increased the bake time some because after 25 minutes, the entire middle of the pan was still uncooked. It’s still in the oven right now, but I’m pretty disappointed with this recepie overall. I never do this, but this recipe is terrible. I went with it because it was the first recipe that popped up on google and I have no idea how it made it so far up on the list. Grainy terrible fudge is what I’m left with. Followed the recipe and I’m an avid cook. I should have read the reviews first. Will never attempt this again. I’m sorry to hear that, Erin! I’m actually working on testing this again to see if I can find the issue. What type of baking dish did you use(material) and size? Hi Kate – I love your creations – you never leave us disappointed! Cannot wait to try these! Every recipe I’ve tried from C + K has come out amazing. I was scrolling through the desserts and couldn’t seem to find the spiced pear cake made with oat flour that I swore was by you about two years ago. If I’m mistaken, please forgive me! If not, would love to see a repost and this time I will jot down the recipe for keeps :) Many thanks in advance and keep up the delicious work! Let me know what you think of them when you do, Linda! Here are my pear recipes: https://cookieandkate.com/search/?q=pear. No cake that you are mentioning. Interested thought though! Made these, and they came out very well. Given some of the other comments, I was mindful to put in a lot of muscle into the stirring and mixing steps. Thank you for the recipe. You’re welcome, ST! I’m glad the comments were helpful. Hi, can I use vegan butter for this? like Earth balance sticks? Hey Dani, this recipe is a little finicky to begin with, and the butter needs to be browned, so I think that would be pretty risky. Sorry to disappoint! Followed this recipe exactly and they turned out terribly. They didn’t rise, “crackle”, or have any fudgey results. More like a dry cake. Cooked 5 minutes longer than recommended and they’re divine! Yum! I’m so happy they turned out for you, Sarah! Thanks for the review, Tooba! Not an advent chef to any degree, but I followed this recipe and the result was exactly what was described. Absolutely nothing wrong with these. No shame in admitting you made a mistake. I certainly do regularly. Keep on Kate. I’m glad they worked out for you! Would you mind telling me the type and size of pan you used? I’m currently working on retesting this recipe. These turned out great! They had the crackly top and were fudgy, but not stick to your teeth gooey.The chopped chocolate is a nice touch and gets melty again if you pop individual brownies in the microwave for 5 seconds. They are very rich chocolatey and go well with ice cream. Notes:The batter is THICK! No joke about the arm power needed. The regular table sugar I used didn’t melt in the brown butter but I didn’t notice it in the baked brownie. Will still try grinding it in the blender next time. I used a round 9″ light color, heavy weight cake pan. I was nervous beacuse there was barely enough batter to cover the bottom. They did rise a little in the oven to about 1/4″ baked. My oven runs hot so I took them out at 25 min and let them cool for 2 hours before taking them out of the pan. Parchment paper helped get them out of the pan, don’t skip it! I don’t like coffee at all and opted for high quality, NON-alkali, natural cacao powder (Scharffen Berger). It’s worth it to get the good cacao as cheap ones can be too harsh. Also, if you use Dutch processed alkali cocoa powder it will react to the baking powder in these brownies and might not taste as good. Thanks for your comment, Sara! I really appreciate it.